COMMUTER omnibus operators in Bulawayo have resolved to reduce kombi fares across city routes to $1,50 from $2 with immediate effect. This followed calls by residents for a downward review of the kombi fares which they said were unaffordable. The price of petrol rose to $3,31 per litre from $1,34 and diesel went up to $3,11 per litre from $1,49 a fortnight ago. Taxi association leaders who spoke to The Chronicle yesterday said they met Bulawayo Provincial Affairs Minister Cde Judith Ncube to discuss the fare issue and present their grievances. 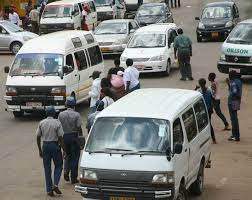 Tshova Mubaiwa Transport Co-operation Chairperson Mr Atlas Moyo said they had agreed to reduce the taxi fare as a measure to meet halfway with commuters. “We met with the Minister, our leader in the province and we presented our grievances to her. We have since agreed on a downward review of the taxi fare to $1,50 from the $2 that has been charged ever since the new price of fuel was announced,” he said. Mr Moyo said the fuel price hike had necessitated an increase in fares. “We also need to feed our families and keep the vehicles fit to avoid road accidents. We are hoping for a better situation as time goes on,” he said. Mr Moyo said they welcomed the introduction of Zupco buses in the city although he acknowledged that they would present stiff competition to their business. “We welcome the return of buses on our routes. We co-existed peacefully in the 1990s when we were using our Peugeot 404s and I think we can still have the relationship that we had back then. We are in business and business is all about healthy competition,” said Mr Moyo. Minister Ncube said she had a fruitful meeting with the taxi associations and hoped for further engagements for the benefit of Bulawayo residents. “We met with representatives of different commuter omnibus operators and they agreed on a downward review of fares to $1,50 for adults and $1 for school children in uniform. We accept this as Bulawayo and we hope that they will continue to review their fares on an ongoing basis in line with the state of the economy and needs of commuters,” said Cde Ncube. Bulawayo City transit spokesperson Mr Daniel Pondo said the new fares were not tallying with their expenses. “We have agreed to the downward review because we can also see that the public cannot afford a higher fare, but this will really cripple us. We are under pressure but hope that we will benefit from the government fuel rebate system to get a subsidised fuel price,” he said. Expriccos taxis chairperson Mr Mpikelelo Khumalo yesterday said most operators would be unable to keep vehicles in shape due to high operational costs.